When Ida Guillory was growing up in Lake Charles, La., playing accordion was not considered ladylike. That didn't stop Ida. She would eventually be crowned Queen of the Zydeco Accordion. "Music -- zydeco music -- was in my family as long as I can remember. I had two uncles that played accordion and a cousin who played violin," she told me when I called her at home in Daly City, south of San Francisco. After the family moved from Louisiana to Texas, Ida's mother would continue to visit their old home in the bayou. "One time she brought back an accordion. She told my brothers, 'I want you guys to keep the tradition, keep the music going.' At that time the youngsters in Louisiana weren't picking it up. Zydeco wasn't cool. So she brought it home and gave it to the boys. When I was brought up, women didn't play accordion. Violin and piano were fine, but not accordion -- that was too masculine." But, after listening to her brother Al develop his chops on the squeezebox, she decided she'd try it out herself. "I borrowed his accordion and went down to the basement where no one could hear. At first I didn't get it, but I kept trying." She didn't really get into playing seriously until years later when her family left their Texas rice farm behind and relocated to the San Francisco Bay Area. They weren't the only ones who'd come from Cajun country in East Texas and Louisiana. And when Ida married a Texan in 1950, they started having zydeco parties at home. "We started with basement parties, then through word of mouth they got larger and larger, and finally we started renting a hall," she recalled. "At that time I wasn't playing much. My brother had a band, but I was still trying to learn." At some point she started taking a turn on the bandstand on a few songs. 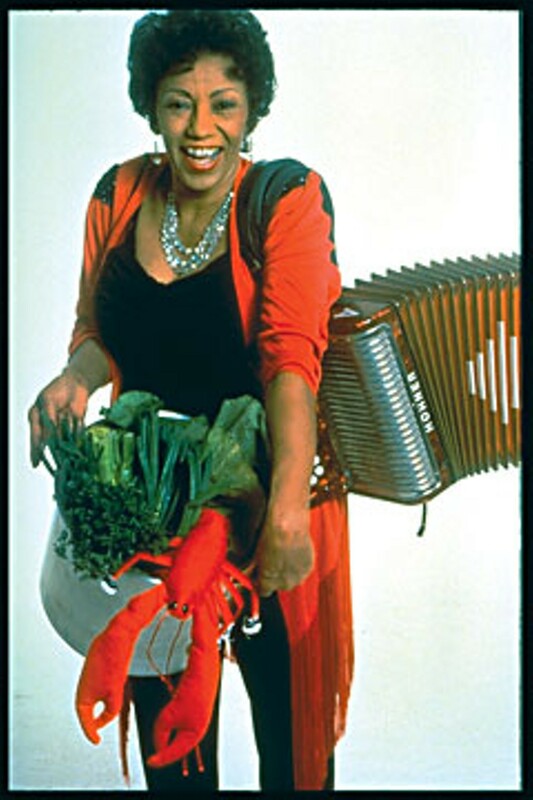 At one show, where a reporter happened to be in attendance for a piece on the Bay Area Creole culture, she was introduced, perhaps tongue-in-cheek, as "The Queen of Zydeco." From the point when that was reported in the paper, she was "Queen" Ida. In the ’70s, a resurgence of interest in traditional culture brought in new crowds and the band started playing the club circuit. They made a few records, even won a Grammy. Her brother, Al Rapone, has since moved back to Louisiana. Ida now works with a band that includes two of her sons, one on rub-board, another on accordion, so she can just sing on some songs. The music maintains its Cajun/Creole roots, but is a bit less traditional than it was in the beginning. "Gumbo is the word for it," says Ida (who is also author of a Cajun cookbook). "It's traditional zydeco as well as other things we throw in the pot: a little bit of country-western, a little bit of blues, even some Caribbean music. It's all that. And people seem to like it." Ready for some of Queen Ida's tasty musical gumbo? She's in town Sunday for a set at the Organic Planet Festival. Details on the rest of the event can be found in this week's calendar section. Queen Ida and her Zydeco Band should hit the stage at around 3:30 p.m., right after the samba parade. Stop on by. You say you can't get enough of that accordion music? Wednesday, Aug. 27, CenterArts brings America's No. 1 rock/pop parodist “Weird Al” Yankovic to the Van Duzer stage for a multi-media show -- and you know what? Al got his start as a SoCal teenager sending twisted accordion versions of rock hits to Dr. Demento, and the squeezebox is still his main instrument. Al's been doing OK: His most recent album, Straight Outta Lynwood, and its hit single, “White and Nerdy,” have taken him to new platinum heights. Even the ringtone was certified gold. There's the usual Farmers' Market on the Arcata Plaza Saturday, once again with old timey gospel byHuckleberry Flint. Sunday afternoon the Plaza fills up again for Concerts on the Plaza firesup with Marin's Latin/worldbeat/funk/jambandVinyl, who also play Saturday night at the Red Fox Tavern. Local funkateersThe Bump Foundation open the Red Fox show. Also on Saturday, an amazing Canadian vocal ensemble called Chic Gamine stops off for a local house concert on their way to the Strawberry Music Festival. Based in Winnipeg's French Quarter, the group includes four women vocalists and one guy on percussion creating music that initially reminded me of early Zap Mama. (My wife says Camille. Either way, great stuff.) It's fairly likely that the show will be sold out by the time you read this, but you can e-mail Joel Sonenshein (joel@asis.com) to check, and/or to get on the e-list for future house concerts. Well, I finally made it down to Benbow to check out the Inn's Summer Jazz Series. It was simply sublime hearing pianist Dena DeRose sing and play under a night sky with Zen-like drummer Akira Tana and bassist Peter Barshay providing perfect rhythmic counterpoint. The setting in the inn's courtyard couldn't be better with friends gathering to enjoy cocktails, good food and wine -- and world-class jazz -- as the stars come out. As noted last week, they have guitarist Lee Waterman and Jazz Caliente coming in this Thursday. Friday, pianist Larry Vuckovich leads a Latin combo that includes Buca Necak on bass, Paul Van Wageningen on drums with Hector Lugo on Latin-style percussion. Vuckovich returns Saturday without Hector, but with Jackie Ryan doing her vocalese thing. Sunday it's bassist Chris Amberger leading a duo. Tuesday, Aug. 26, the fine local vocalist Mary Jo Casasanta fronts a quintet. Wednesday, Aug. 27, Eric Shifrin is up from San Francisco to play the Inn's grand piano. Humboldt Time returns Thursday Aug. 28. The series closes out next weekend with the Wayne Wallace Latin Quintet on Friday, Aug. 29; followed by a Saturday, Aug. 30, show with Akira Tana and Sound Circle featuring former localRandy Porter on piano with special guest Maria Volonte on vocals. If you dig jazz, well, it's well worth the drive south. Head on down. The Lil' Red Lion just keeps on (alt.) rockin'. Thursday they have über-cool alt. something band Indian Jewelry on the "West Co$t" leg of "Che's Funky Bolivian Expedition 2," plus Sweaty Sweaters, an instrumental prog trio from Bellingham, and James Harkins' zombie-surf-emo band The Invasions, perhaps that band's last show. Friday gets loud with San Fran's self-described "drunk punk" combo The Bar Feeders, heading home from something called Total Fest in Montana and probably hung over. They're here with another Frisco punk outfit, The Penny Dreadfuls (formerly known as NNP). Saturday it's groovy, lo-fi, Beatle-esque Portland duo BoomSnake sharing a bill (if not an aesthetic) with Idyllwild punks Liquid Wagon. The Lil' Red action resumes Tuesday with more neo-prog by La Fin du Monde out of Chico plus Portland's System and Station, who are on the road with a brand new CD, A Nation of Actors. Fortuna may have lost its all-ages haven Out of the Sun, but the scensters persevere. Monday, Aug. 25, they're throwing an end-of-summer back-to-school all-ages punk rock bash at the Fortuna Vet's Hall with four bands: Nural, The Material, A Farewell Device andThis Dying Wish. And so it begins. With the students back in town, CenterArts kicks of its new season Tuesday with two shows at once. Aussie folk rockersThe Waifs are in the Van Duzer playing tunes like the title track from their fine new album, sundirtwater: "Well if your holding out on something, then just reach and we'll rise above -- give me Sun, give me Dirt, give me Water, give me sweet everlasting love." Meanwhile in the Kate Buchanan Room British roots RastasSteel Pulse lay down some serious reggae led by the dreadlocked David Hinds. Then Thursday HSU's Associated Students take over with HumWeek 2008(apparently named in tribute to this column) withOzomatli, Brett Dennen, !!! and Upright Citizens Brigade. More details next week. Advance warning from Mike Dronkers: "Brett Dennen will perform live on KHUM 104.3/104.7 during the noon hour on Thursday, Aug. 28." Between the free exchange of music in the digital age and the rising cost of touring, how does a musician make a living? That question arose when I talked with Jason Munning, lead guitarist for the San Francisco-based folk/country/rock band Ten Mile Tide. Jason and his twin brother Justin are out front in the band, who have a sound that reminds me of the Nitty Gritty Dirt Band. (Jason had not heard of them.) The money thing came up because I noticed that all of the bands recordings were available as free downloads on their website. "I wonder how independent bands ever did it," said Jason. "Everyone talks about how file-sharing make it hard for musicians to make money, but the fact is, as an independent band, if we hadn't given our music away for free, people wouldn't have heard of us and no one would be buying our CDs. We went the other extreme and promoted giving the music away: Download it, burn it, post it, whatever. That model might scare some record labels, but it's brought us a following. Believe it or not people still buy our records from the website, to give as gifts or maybe just to support us. We found that it increased our touring income. That's where bands make most of their money today." He admits that it's harder with current fuel prices. "We focus on anchor dates, private shows, weddings, or festivals where we make more money. At this point we have those coming in. It would have been hard to start off cold, and the truth is, we're still trying to figure out how to make it all work." Wanna do your part? Ten Mile Tide plays Friday at the Red Fox Tavern. Pay that cover and don't spend too much on drinks. Buy the damned CD after the show so they can fill the gas tank.